A nun, coming from an Abbey, becomes the new governess of the seven Von Trapp children, eventually wins the Baron's heart. Robert Wise (who also won the Oscar for direction). Julie Andrews / Nominated (MARY POPPINS, THE AMERICANIZATION OF EMILY, TORN CURTAIN, THOROUGHLY MODERN MILLIE, S.O.B. With Eleanor Parker, Richard Haydn, Charmian Carr, Anna Lee, Portia Nelson, Daniel Truhitte, Norma Varden, Marni Nixon, and Angela Cartwright. Irwin Kostal received the Music (scoring adaptation) Oscar. William Reynolds received his Oscar for Editing. James P. Corcoran and Fred Hynes received the Sound Oscar. Mary Martin was the star of Broadway version of this Rodgers-Hammerstein musical. A major box-office success (out performed GONE WITH THE WIND) which was based on the real life experiences of the Von Trapp Singers. 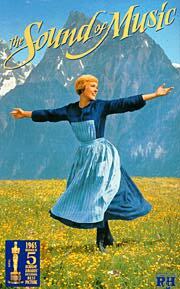 Memorable songs include: "My Favorite Things", "Do-Re-Mi", and "Climb Every Mountain". They did extensive location filming in Salzburg, Austria.